Maximize your online marketing efforts and increase your new client conversion rate with our Live Chat service. Our proven online service offers potential clients who are visiting your website the ability to chat with a customer service agent 24 hours a day and 7 days a week. We know that customer service and accessibility is a critical component for people who are searching for products and services on the Internet. Online chat is a powerful tool for enabling those potential clients to have an immediate and positive interaction with your company. 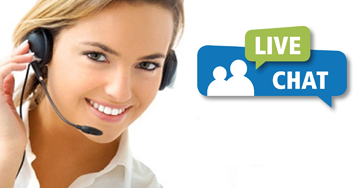 Live chat reassures potential clients that your accessible 24 hours a day, 7 days a week. Our customer service agents are trained to answer initial questions, set appointments, schedule follow-up calls, and most importantly; collect contact information. And with the included Call Connect service, our customer service agents can even connect potential clients to your phone number from within the live chat window. With every online chat we provide you a full transcript of their entire conversation. We can also send real-time alerts letting you know there is a live chat in progress, the details of that chat, and notification that a phone call is about to be transferred. We can also set after hours rules that allows us to transfer calls to various cell phone numbers or answering services. Our Live Chat service is just one more great tool to help you build your business, gain more customers and increase sales. We customize both the chat widget design for your website and the chat responses our chat agents will use. Takes only a few minutes to add our live chat widget to your site. Our support team will take care of the rest. We start chatting with your website visitors, sending you qualified leads in real time via email, text message and/or live call connects. Qualified Leads Only: Your only billed for qualified leads. A qualified lead is a lead that is within a geographical region specified by you (our client), and must include a contact name, email and/or phone number. Additionally, the potential customer (lead) must indicate interest in a specific service that you offer. (For Example. If your an attorney who does wills and estate planning, you would not be billed for someone who was looking for a defense attorney.) Your never billed for existing client questions. Skill-Based Routing: Chats routed to our agents trained to handle specific industries. English & Spanish: Both languages available for your website. Call Connect: Transferring from live chat to your phone line in real-time. Fully Customizable: Make every aspect exactly the way you want it to look on your website. Multiple Chat Agents 24/7/365: When web traffic spikes our team of chat agents has you covered 24/7/365. Geo-Mapping & Routing: Google Maps integration ensures you get customers from your service area. Mobile Optimized: Chat invites and windows sense mobile devices and adjust accordingly. Intelligent Pricing: Set your budget and manage your spending with lead flow pacing. Flexible Reporting: Visitor, chat and lead reports for deep insight and analytics. Custom Invitations: Chat invite can have custom look-and-feel, messaging and animation. Custom Branding: Chat elements can be branded with your logo, images and more. Custom interactions: Chat responses can be tailored to include questions, answers and messages specific to your business. Office Hour Tracking: Chat responses can behave differently based on office hours. CRM Integration: Full integration with many CRM systems in use, including SalesForce.com and InfusionSoft. Pre-Defined Scripts: Pre-compiled responses transferred to chat window.